Today, I'd like to address one of the most common mistakes that new or young artists make when they start drawing animals: "Backward knee" syndrome. This is one simple tip, but if you haven't discovered it yet, it's going to make a world of difference. "Digitigrade" is an animal that walks on its digits, or toes. digitigrade animals include canines, felines, elephants, birds, dinosaurs and more. 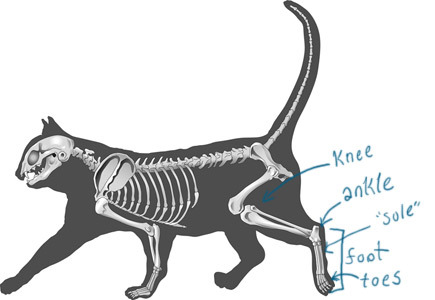 Comments on "Digitigrade animals don’t have “backward knees”"
Thank you! This has been bothering me for a very long time. I've just avoided drawing animals. So glad to be helpful! I remember my own "aha!" moment when someone first showed me a canine skeleton. The really funny one is an ostrich, the knee is hiding~! Mike Rowe made this same mistake on "Dirtiest Jobs" when he visited the Ostrich Farm. It's an eye opener, isn't it? :D I remember my aha moment! This is a great post. I learned with animals though, so my opinion probably doesn't count. This is the same with birds, a lot of people don't realize, and it's even harder to show since their hip and upper leg is on the inside of their body and it's nearly impossible to see. At least with mammals you will have vague points that resemble human anatomy. Another thing I want to point out is that some animals are plantigrade (not including the obvious primates) and a lot of people don't know this and once they learn how to draw dogs and cats may incorrectly draw bears and mustelids (weasels). The more you know. 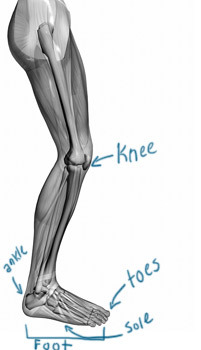 What is the joint between the ankle and called? Never mind. I was looking at the picture wrong. Also, another tip - ungulates (hooved animals) are like other digitigrade animals, with a catch - they walk on their nails, not even their toes! Horses have one toe with one nail that they walk on, pigs and other ungulates have two-four toes and walk on those toenails. That's all a hoof is - a big ol' toenail! Ha! Ha, ha, ha, ha, I spent 4 years in an accredited university carrying a double major, one of which was biology. You would think this would have been taught in the physiology classes, or at least covering mamology. This is brand new to me and is amazing. Learning is a life long persuit and this just put me forward on the learning scale. That was magnificent.